The MTSU School of Music’s popular “Keyboard Artist Series” will end with a special flourish Friday, March 29, when internationally renowned American pianist and Van Cliburn International gold medalist Jon Nakamatsu performs in a public concert. Nakamatsu’s performance will begin at 7:30 p.m. March 29 in the Hinton Music Hall inside MTSU’s Wright Music Building. A campus map is available at http://tinyurl.com/MTParkingMap. Admission is $10 for adults and $5 for seniors; children under age 18 will be admitted free, as will MTSU students, faculty and staff with a current ID. Tickets, which help fund the Keyboard Artist Series, are available at http://mtsuarts.com and at the door. The concert series, sponsored in part by the Steinway Piano Gallery of Nashville and now in its fourth season, features MTSU faculty and distinguished guest artists from around the world. “Jon Nakamatsu is a world-class artist on the level of many of the greats who have ever lived,” said Adam Clark, an associate professor of piano at MTSU and co-director of the Keyboard Artist Series. Nakamatsu’s MTSU Arts-sponsored concert will include Muzio Clementi’s Sonata in F sharp minor; Ludwig van Beethoven’s Sonata No. 15 in D major, Op. 28, also known as “Pastoral”; and Johannes Brahms’ Sonata No. 3 in F minor. Nakamatsu, a native of California, came to international attention in 1997 after he earned the gold medal at the Van Cliburn International Piano Competition, the only American to have achieved the distinction since 1981. He’s performed around the world, working with various chamber artists and touring multiple times with the Berlin Philharmonic Wind Quintet. He’s released 13 CDs to critical praise and also performs with clarinetist Jon Manasse as the Manasse/Nakamatsu Duo. The two also serve as artistic directors of the Cape Cod Chamber Music Festival. You can enjoy a preview of Nakamatsu’s performance below. 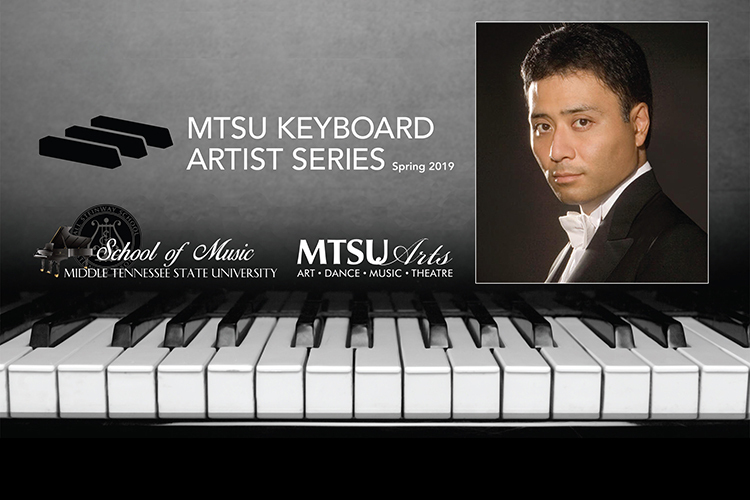 Nakamatsu also will help MTSU celebrate “Piano Day 2019” Saturday, March 30, by spending the day as the guest artist for and teaching two sessions of the Piano Masterclass Series. For more information on Piano Day 2019, which is free and open to the public, visit http://mtsu.edu/music/masterclass.php. For more on the Keyboard Artist Series at MTSU, visit www.mtsu.edu/music/keyboardseries.php. For details on other School of Music events, call 615-898-2493 or visit the “Concert Calendar” link.